TESDA is known as an institution that gives courses of vocational skills and gives people opportunities to land better jobs not only in the country but also abroad. Fortunately, while many think that one has to go personally to TESDA classes, TESDA now offers free wide range online courses. Free online courses ranges from digital arts and programming to bartending and other skills. This is good news for those who have no budget for a TESDA course or have no time to go to classes. With just a computer and a trusted internet connection, Tesda courses are within your reach. If you are interested, there are different online programs that are available for you to choose from as they cater for all who wants to develop technical knowledge and skills including OFWs, out of school youths, professionals, and laborers. These TESDA online courses gives you the liberty to choose a program, take the class at your own leisure time and in the comforts of your own home. You must know that though you finish the online courses, you will not get a certificate of completion yet. You will have pass an evaluation test in a Tesda assessment center before yu can get a certificate and use it for job hunting or as an addition to your resume. You can visit a Tesda office near you to ask for more information. If you have decided to give it a try you can first make an account and register in http://e-tesda.gov.ph. Visit the site e-tesda.gov.ph and click the Login button on the upper right corner. Then when you are directed to the next page, click ‘New Account’. Fill in all the needed information to make a new account. Do not leave a blank space and make sure all your information are right and consistent. Also, make sure that your email is active and valid as a confirmation will be sent there. After all these are done, click ‘Create My New Account’. Next, Login the email that you had provided. Open the email from Tesda. You might not find the email in the inbox to try checking the spam emails. 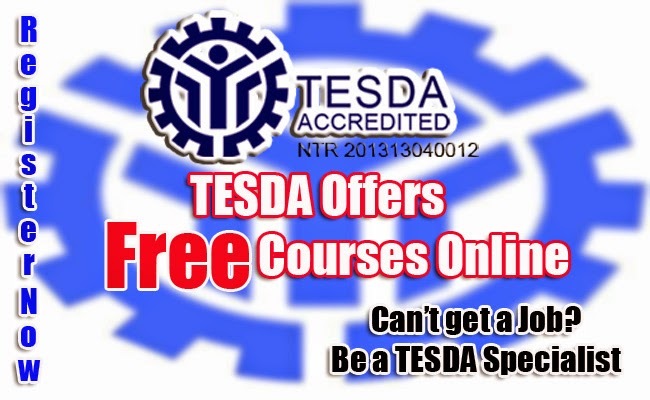 Click the link sent by Tesda and you will be taken to a page where you can choose a program you would like to take. Do not forget to login first. After choosing a course, you will see the modules that you will have to study. Click ‘Enroll Me in This Course’ to make a pop up confirmation message appear. Choose Yes to start learning the course. Finish the course and f you want to have a certificate. Pass the test in a Tesda testing center.